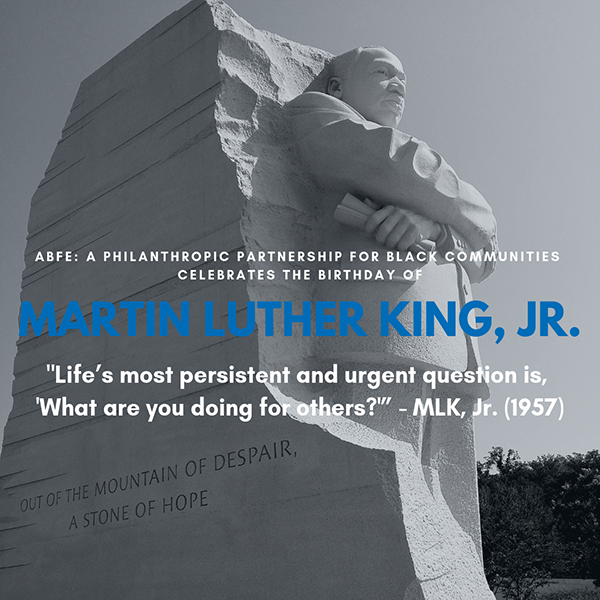 On behalf of ABFE: A Philanthropic Partnership for Black Communities, we want to wish a Happy Birthday to Martin Luther King, Jr. today. I also want to share my thanks and gratitude for your never-ending advocacy on behalf of Black communities. Dr. King’s birthday is an opportunity for all of us to reflect on the progress this country has made relative to his vision and dream for America. This time of the year is always one of deep-reflection for me too and I want to take this time to share a few thoughts on the current state of philanthropy and where we must head in 2019 and beyond. Philanthropy must put more emphasis on hiring people who are competent on issues of racism in America. Too many professionals in the sector, at the pinnacle of their careers overseeing millions of dollars, do not understand the truth about America. While we will continue to provide training on racism and racial equity in the years to come, it is important to raise the bar on what is an acceptable “starting point” in this work and who, in fact, is eligible to lead. There will always be a need for support to ensure that institutions can build credible theories of change to undo racism and eliminate racial disparities. However, we must hold ourselves accountable for the sector’s leadership to understand principles of structural racism and white privilege as a prerequisite for gaining C-suite positions. This calls into question traditional hiring practices, use and capacity of search firms, etc. We need to make a stronger connection between undoing racism, achieving racial equity and building power through philanthropic action. Now is the time to demystify “racial equity grantmaking” and help funders move money to Black-led organizations, leaders and networks that focus on building power in Black communities. One of my favorite quotes is from Frederick Douglas, “Power concedes nothing without demand, it never has, and it never will.” Recently, we published the Case for Funding Black-led Social Change, in partnership with The Hill-Snowdon Foundation, which calls for investments in Black-led infrastructure in seven key areas to build political, social and economic power. These tenets make up our Responsive Philanthropy in Black Communities framework and we will move to stimulate action in these areas in 2019 and beyond. More emphasis needs to be placed on understanding anti-Black racism. It is still easier for the field to talk about racism than it is to talk about Black people. Too many times we were asked by funders to “soften our focus” on talking about racism through an anti-Black racism lens. Common questions we heard all year were, “Aren’t we going to talk about other people of color?” Or, “your framework will not work here on the west coast.” No doubt, anti-Black racism describes the unique discrimination, violence and harms imposed on and impacting Black people specifically. However, because this country put in place so many structural barriers to oppress Black people (to quote Ta-Nehisi Coates, “200 years of slavery, 90 years of Jim Crow, 60 years of separate but equal and 35 years of racist housing policy…”); we have a lot to learn about how to tackle all forms of oppression by using an anti-Black racism lens. In 2019 and beyond, lets challenge the field to talk about Black communities. While these reflections sound more like challenges, we remain optimistic at ABFE about the work ahead and look forward to working with all of you. Happy Birthday MLK and Cheers to 2019!